Students at Bennett Day School in Chicago observe a prototype demonstration. Northwestern collaborated with the school to test technology-based educational devices in classrooms. From simple coding to advanced robotics, a collaboration launched by Northwestern teaches technology to students at Bennett Day School, a private school in Chicago. 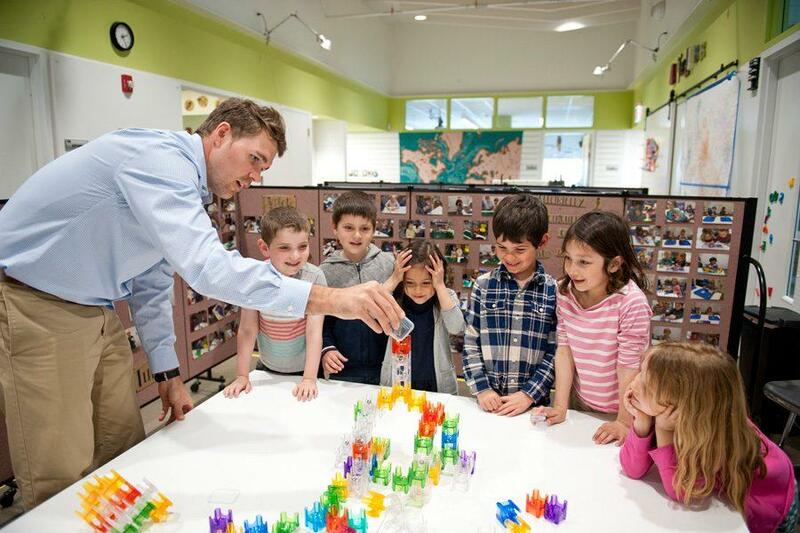 The partnership is led by SESP Prof. Michael Horn and Bennett Day School teacher Frances Judd, who are both part of TIDAL Lab, a group that researches innovative, technology-based education. Northwestern faculty and students work with children to teach them technology skills and test prototypes for educational devices, Horn said. Horn said he launched a pilot program with Judd during the 2015-16 academic year partnering to teach technology at Bennett Day School with his Introduction to Design class. After seeing the success the partnership had, he decided to continue the program. Osmo is an example of an educational device born from the collaboration. Designed to take an interactive approach to teach children simple coding, Osmo allows children to enter programing language using blocks that control a character on an iPad screen. When Osmo was first presented to Bennett Day School students as a prototype, researchers used the product with the children and collected feedback from them. Judd said the University will benefit from the collaboration because researchers and design developers will be able to witness authentic moments where learners of different generations collaborate. Bennett Day School students can also benefit from the collaborative, project-based work provided by the partnership, said Cameron Smith (School of Law ’07), founder of the school. Smith said project-based learning helps students retain and apply more than 66 percent of what they learn after a year. In a more traditional classroom environment, students retain less than 20 percent of what they learn after a year, he said. Judd said she sees the collaboration as a way of providing mentorship for younger children and breaking down age barriers. She said the fact that the children are taken seriously by adults will be enough to inspire them. Horn said he and Judd have only just begun to explore the possibilities the collaboration holds. Future plans include writing coding to create small, mobile robots and incorporating environmental sustainability and smart home technologies into the curriculum to teach how energy consumption relates to the environment. Ultimately, the program aims to understand how best to inspire innovation among young students, Judd said.